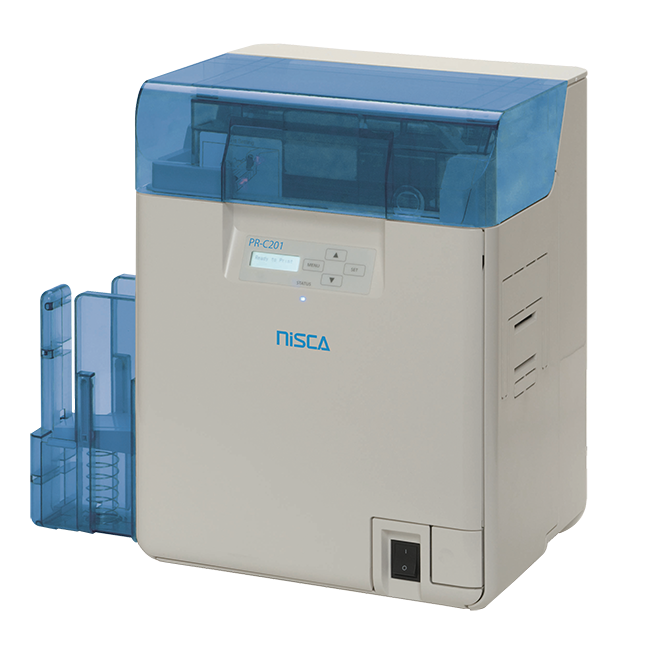 The Nisca PR-C201 is a worldwide unique 600 dpi high quality card printer for ambitious and high security related plastic card projects. The PR-C201 stands for amazing print resolution and 24 bit color brilliance. The Nisca PR-C201 card printer is an unique high quality printer, which prints single- or double-sided plastic cards in 24 bit color mode with an amazing print resolution up to 600 dpi!Due to the double resolution of 600 dpi (usually card printers print with 300 dpi maximum) the Nisca PR-C201 card printer provides you with special visual security features like guillochen and microtext, which can not be reproduced or reprinted with 300 dpi card printing systems. Guillochen are extremely thin asymmetric shapes and forms which can not been detected by ordinary scanners or camera systems, while microtext can only recognized with magnifiers. This print technologies transform your badge into a furgery-proofed and also high quality ID solution! For this reasons the PR-C201 from Nisca is your ideal printer for every high quality or security related card printing project.Optional lamination and encoding modules – for magnetic stripes cards, contact chip cards and RFID chip cards such as MIFARE or LEGIC cards – are also available for the PR-C201 card printer. Thanks to the advanced retransfer technology, plastic cards with any surface can be printed over the edge. USB and ethernet interfaces as well as an easy to exchange ribbon cartridge make printer usage customer-friendly and comfortable. The removable cartridge for the card feeder holds up to 250 cards safely and dust free. With these cartridges, different preprinted card versions can be stored. The Nisca PR-C201 printer delivers exceptional 600 dpi printing quality – fast, reliable and conveniently. Do not hesitate to get in touch with our experts and get some demo prints! As an official Nisca partner we support you with technical support as well as professional service.